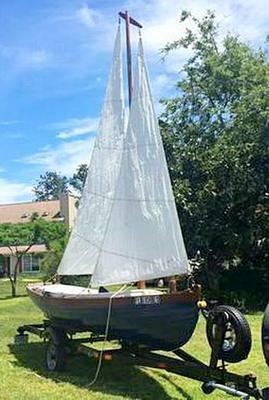 Jersey Beach Skiff made from Florida BAld Cyprus 16.5 foot centerboard. Boat has been refinished ,painted and varnished. Mast has been stripped and varnished. 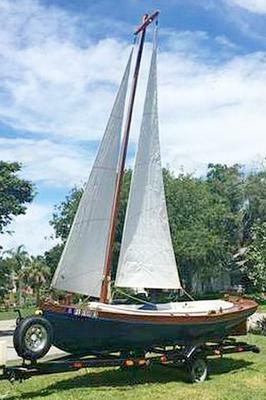 Complete with roller furling both on main and jib for ease of handling and sailing. Includes a barely used Suzuki 6HP motor. Boat comes complete with all hardware and rigging. Two rudders, two tillers, boat hooks, handmade oars, boat cover and much more. Trailer has been refinished including new boards, new lights, new tires and new spare. Call or text (850) 766-9330 or email shall.07@aol.com. 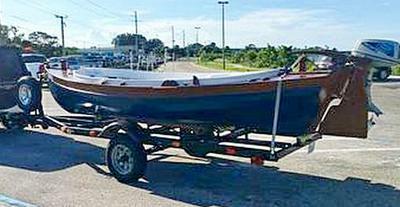 Boat is located Merritt Island, Florida.